A special thanks goes to Uthak at the original Tanks forum who put this together. Please note that this is not an official document, although it does include official statements from Sean and Andrew from BF/GF9. Until an official document surfaces (and Chris has hinted that we will see this later in the year), this serves as a excellent pointer for a number of questions that arise in your games. Certain questions do not have a definitive official answer. These points are marked Discussion Point and discussion in the forums is actively encouraged. Should a discussion begin about one of these points, a link to the thread will be inserted. 1.) What does "Dr. Franz Bäke" rule mean by saying make a “normal move” in the beginning of the game after both sides have been deployed? Answer: He may make a single one-arrow-move. That's right, a 'Move' is one use of the arrow. 2.) Can I re-roll re-rolls? No, once you re-roll a die the second result must be used. This was not covered in the core rules but will be addressed further in the FAQ once it is completed. 3.) Does Cover stack? Say firing from within Cover into another piece of Cover? Answer: No, Cover does not stack. Cover does not stack, it's a state that you are either in or out. 4.) Can I pre-measure? If so, what can I pre-measure, what not? Answer: Yes, you can pre-measure anything you want. Andrew at Tanks HQ wrote: you can pre-measure. 5.1.) Which player begins making repairs in the Command Phase? Answer: HQ officially leaves this up to us. Unfortunately. Andrew at Tanks HQ wrote: Repairing is done in any order the players want. German tanks that elect to give up repairing to make a Blitzkrieg move must execute these movements in initiative order using their movement initiative stat. 5.2.) In what order do I repair my tanks? Answer: In any order you want. Unfortunately. 5.3.) In what order do I need to make my Blitzkrieg-moves (if applicable)? 5.4.) When do I Repair Damage and when do I make my Blitzkrieg moves? What comes first? Answer: You attempt repairs before making any Blitzkrieg moves. Andrew wrote: Repairing happens before blitzkrieg. 5.5.) Can I still make a Blitzkrieg move if my tank received a "Bailed Out"/"Busted Track" effect (may not move)? Official: The rules for "Blitzkrieg" clearly state, that "This tank may make a single Move [...]" which would be made impossible by the "Bailed Out" rules: "This tank cannot Move or shoot.". 6.) What is my maximum attack-range? Answer: There is no maximum attack-range. 7.) Does my own Cover grant cover to my opponent / how does Cover/Woods work? Answer: Yes, but it depends. If you are in the middle of a Woods and shoot at a target outside said Woods, said target receives a cover-bonus from the part of the Woods that is in the Line of Sight (los), even though you are hiding in it. In order to be in Cover but not grant it you need to place you gun-mount OUTSIDE of said Woods (on the border). Official: RB p.12; Cover / “Ignore terrain directly underneath the shooting tank (not the whole terrain piece) when determining if the target is in cover.” / also see picture on page 12. 8.) Does my “Cautious”-move change my movement-token – therefor modify/grant me Cover? 9.) May I use re-rolls when firing a Tungsten-/Super-velocity Shot? Answer: Yes, special shots are checked after you made all your re-rolls and your final results are fixed. Andrew wrote: Tungsten Shot still applies to the re-roll, since that is still part of the same attack. You only check for the double ones once you have made your re-roll and your final results are fixed. 10.) Can a tank that is equipped with "... Loses the Fast-keyword" use a Supercharger to gain "Fast"? Answer: No, "... Loses the Fast-keyword" is a continuous replacement effect, so after you discard Supercharger to gain “Fast”, the losing-rule immediately removes it again. Andrew wrote: Yes while you have a card face up that makes you lose the Fast keyword then you cannot gain Fast via any means. If you had something like Concrete Armour that must start the game face up, and Supercharger, once the upgrade is discarded to cancel the critical hit you can once again gain Fast since the concrete armour has been discarded. 11.1.) Do Critical card-effects stack? Answer: Yes, they do. Even if causing 0 damage and the effect stays the same (eg “Bailed Out”), you will need to remove all instances of said cards to delete their effect entirely. Andrew wrote: Yes each damage card must be dealt with on their own, one at a time. If your tank has multiple bailed out cards, then you been really unlucky and have a massive morale issue with that tank, it will take more then one successful attempt to get this crew back into their tank. If you tend to get a lot of the same damage cards in games having cards like Liquid Courage would be helpful to get your tanks moving again. Some damage cards effects even stack, if you have two stunned crew, each card will subtract one from your stats. 11.2.) When successfully repairing a repairable Critical Effect, do I also repair the potential Damage inflicted by its application (life/hull points lost)? Answer: No, you don't. You only remove the cards/(their Effect), whereas the Damage it inflicted is not part of the ongoing effect and thus will remain. RB p. 14 wrote: 3. Repair Damage "When you repair a Critical card you only remove the card and its Special Effect, any Damage taken from that hit remains." 11.3.) When having to draw multiple Critical Cards from the same attack - Do I draw and resolve them one after another or do I draw all cards and then chose in what order to apply them? Andrew wrote: You resolve each damage card one at a time. Draw one, resolve it and draw the next. 11.4.) When having to draw multiple Critical Cards from the same attack - how do they get applied? Do effects stack? Answer: Critical cards get applied one at a time. Therefor “Ammo Explosion”, “Damaged Equipment” and “Injured Crew” apply their effect after one-another. This means you cant discard two “Injured Crew” cards with one crew-member to save the rest, but have to discard first one, and then another crew member. For Ammo Explosion: All Ammo Upgrades (if applicable) explode and deal their extra damage on the first instance, further instances only apply the regular damage (3), for the Ammo Upgrades are already gone (rather blown up). 12.) Is there a difference for shots to the Side or the Rear of a tank? Answer: No, there is not (right now). Or rather: There is no rule differentiating between Side and Rear. RB p.12; Side Shot2 wrote: “Subtract one Defence die if any part of the shooting tank's hull (excluding protruding gun barrels) is behind the front of the target tank.” - this condition is also met when you are totally behind said tank. Sean wrote: Getting behind an enemy tank confers a side shot penalty to the defending tank, who loses a defence die. 13.) How many Critical card-decks do you need for playing? Share one or one per player? Answer: You need a single deck that you share. Weirdly enough. Sean wrote: a shared deck, with the standard 32 cards, is a must for competitive play. 14.) What happens if all tanks (from all players) get destroyed during the same command phase? Official: No statement / There is no rule specifying this. Answer: Yes, you can. The target tank will not be marked as destroyed until the command phase. 15.2.) Can "Wheeled" vehicles still attack after being destroyed, just like normal vehicles ("Final Fury")? Mark any tank that no longer has any Damage left by placing a Destroyed token on the tank and discarding all Critical cards placed on it. For the rest of the game this tank stays in place as Impassable terrain. Official Tank Card wrote: Wheeled Remove this tank from the game if it is destroyed. Answer: Yes, you can. You're still attacking, just with zero (0) dice. However you will still need a valid, visible target to "shoot" at. Andrew wrote: With Damaged Optics you still shoot. You are not replacing the attack with an effect, you are just rolling zero dice. 17.1.) Artillery keyword. It states that the tank can shoot at tanks blocked by other tanks. Does the target still receive Cover? 17.2.) Artillery keyword. It states that the tank can shoot at tanks blocked by other tanks. Does that include friendly, blocking tanks? Answer: Yes it does. The rules for Artillery don't differentiate between enemy tanks and friendlies, therefor the word “tanks” refers to ALL tanks. 18.1.) When discarding “There is always vodka”, do I receive +3 initiative for that turn (+1 for having “Tiav” equipped at the beginning of turn and +2 for then discarding “Tiav”)? Answer: No, you only receive +2 initiative, because as soon as you discard “Tiav” you lose the +1 for just having it equipped. Sean wrote: 1. Correct. The +2 Initiative lasts until the end of the turn, but the +1 has been discarded. 2. Correct. You get one turn of boosted Initiative before the stocks of vodka are drained and you're back to the basic stat. 18.2.) How long does “There is always vodka” last? As the effect of the discard lasts until the end of the turn, does the tank still have +2 initiative for the shooting phase? Answer: Yes, the effects last all phases of the turn. 19.1.) Does the “Quick Turn” movement give me a movement-token? Answer: No it doesn’t. Other cards with similar effects clearly state if they do so. Sean wrote: Quick Turn is not intended to add to your movement speed. 19.2.) Does the “Quick Turn” movement change my status from stationary (when applicable) to moved, even though I don't receive a movement token? Thus: Do I still get stationary re-rolls (and other benefits for being remaining stationary: like Camo Netting)? 19.3.) After using a “Quick Turn” move after all movement is finished your initiative drops to zero (0), how do modifiers that only apply during the shooting phase work here? Do they add their respective bonuses to the new value of 0 (Radio Coordinator, Aggressive Commander, etc.)? Answer: Your Initiatve drops to zero (0) at the end of that Movement Phase, so Yes, modifiers applied in the Shooting Phase still get applied and modify the new value of zero (0). This also means (eg) that a Radio Coordinator can now overwrite said initiative of zero (0). 20.) If my tank is behind a wall or hedgerow (“Hull Down”), but his gun can peek over the terrain, does he count as in cover? Answer: No, not for now, as there at no official rules for those types of terrain/or tank positioning. Official: These types of Terrain have no classification/rules in the rule book, and, unless agreed upon differently with your opponent, neither give cover nor hinder Line of Sight. If you agree with your opponent to count them as “Buildings” (page you would technically not be able to draw a Line of Sight across said wall/shoot through/over it, and if you declare it “Woods” (page you wouldn’t be able to shoot through it either, unless you entered it - which also sounds incorrect. 21.) Can I use “'War Daddy' Pool” to upgrade one (1) normal hit to a Critical hit and then use a “Deadly Gunner” to make said Critical hit back into now two (2) normal hits? Comment/Opinion/House Rule: Yes, I don't see any rule prohibiting you from modifying a single hit twice. I would assume this case is similar to when you can have more defense die than 6 when using all modifiers, prior to adjusting to the final count of 6. Here: The final result of the shot would be determined after all re-rolls and modifiers have been applied. 22.) Do “Defensive Driver” and “Add-On Armor” let me re-roll a defensive die every time any tank chooses this tank as a target, or only once per shooting-phase? Answer: You may use such re-rolls every time anyone shoots said tank. 23.) Can I drive through a Destroyed Tank? Answer: No, you cant. Destroyed Tanks count as Impassable Terrain, and as such Movement aiming to cross said Impassable Terrain ends and the border of said Impassable Terrain. 24.1.) Can I drive through operational tanks? Answer: Yes, you can. Weirdly enough. Operational tanks (for now) don’t count as terrain nor Impassable Terrain – Thus they don’t block or hinder movement. However you need to clear the tank and have enough room to place your tank on the other side to make such move. Consider the arrow a maximum straight line, but in reality any combinations of movement that lead to that point are possible. 24.2.) Can I park/stop my movement in/on top of another tank (operational, friendly, enemy or destroyed)? 25.1.) Minefields. A tank uses its first movement of the phase to check a minefield. It triggers a mine and damage is rolled immediately - scoring sufficient damage to destroy the tank. Does said tank now still make the roll to clear the minefield? Answer: Yes, it stays alive and active until being Destroyed in the Command Phase. 25.2.) May the tank then proceed to move its remaining movement? 25.3.) If its movement permits, may it trigger and clear additional minefields this turn? 25.4.) May it also then attack and be attacked in the Shooting Phase? 25.5.) When does Cautious check for Destroyed? Could this tank still make its Cautious check and keep moving? Answer: “Cautious” checks for remaining Damage Points (I like to call them Hull Points) in order to even enable to roll for the extra move. So No, this tank may not make a “cautious” move. If you're wondering when Damage Points get taken off: right when the damage occurs, just the assessment of Destroyed happens in the Command Phase. 25.6.) If a living tank triggers a minefield during its Blitzkrieg Move and suffers sufficient damage to Destroy it, does it wait until the next turn's Command Phase to be marked destroyed and remain moving, shooting, and otherwise participating in battle as a healthy tank until then? Answer: Not 100% clear how to read the official response, but I understand that Yes, a tank that dies during his Blitzkrieg move gets to live another whole round, since Destroyed Tanks have already been marked. 26.) Can I have more defense die than 6 before bringing the total down to the maximum 6? 27.) Can I have more than 6 Attack dice at once? 28.) Do the defensive re-rolls gained with "Vasily Krysov" apply on every instance the tank is shot at in the adjacent Shooting Phase? Answer: No, any re-rolls gained with "Vasily Krysov" apply only once for the whole remainder of said turn. Example: if he moved twice you gain two (2) re-rolls for the whole shooting phase, no matter how often you get attacked and have to roll for defense. 29.) When applying the special rule of “Assassin”, who gets to chose what Crew Member to discard? Comment/Opinion/House Rule: The rule text state that the defending player discards a Crew Member, but doesn’t clarify who gets to pick said Crew Member to be discarded. For simplicity I would assume it is meant that the target may choose whom to discard, and the benefit of Assassin is rather to generally focus crew - not to pinpoint them. 30.1.) In Victory Point (VP) missions, does having multiple uncontested tanks occupy a Mission Objective give me a VP per tank per turn? Answer: No. One Objective = One VP per turn, no matter how many tanks are on it. 30.2.) Can an abandoned tank/tank without crew (Bailed out and/or all Crew Member's discarded - when all slots were formerly filled) hold a Victory Point/contest it? Answer: Yes, it can. As long as a tank is not marked as Destroyed he counts as operational for all rules and concerns. 31.) Can I shoot through my friendly tanks? Answer: No you cant. Any and every tank blocks the Line of Sight if its drawn through it. 32.) Does “'Bobby' Woll”'s special attack (separate 3 die attack within one measuring stick) benefit from other modifiers like “Michael Wittman”'s +1 attack die? Answer: Yes, it does. In that instance the special attack would now be rolled on 4 dice. Thus re-rolls and any other modifiers may apply to this special attack as well. 33.) Does “Ernst Barkmann”'s attack-re-roll only count for the first time it shoots in a game, or for the first shot fired every turn? Answer: It counts for the first shot every round. The phrasing is directed to clarify that you may not re-roll the re-roll, even if its condition gets fulfilled again (no uncanceled Normal or Critical hits). 34.) Can I discard “Damaged Optics” right after drawing it, if I happen to already having shot that round? Answer: No you can't. The card only comes into effect when its drawn, and if you have already shot before you drew the card, it didn't cancel out the cards effect. 35.) Do I need to apply the special rules of all my crew and upgrades all the time/as soon as applicable? Answer: Depends, but for most cards, No. For many cards you can chose to keep them hidden in spite of their benefit in order to use them at a different time to bigger use/surprise. Excluded are cards with an eye on them, which have to be open all the time. Answer: Yes, both tanks gain Cover in both scenarios. Tanks completely within Woods, and anything they shoot at, is in Cover. 37.) What do Hills do in Tanks? Do they obscure Line of Sight?? Answer: No they don’t. Weirdly enough. The game currently does not support elevation, and draws line of sight only in 2D. Unless the hill/mountain/elevation is also a known form of terrain it does not influence the game play. Comment/Opinion/House Rule: However having hills etc. interfere with Line of Sight makes good sense and will be most likely implemented very soon into Tanks. A good house rule could state that a tank entirely behind a hill cant be seen, therefor not shot at and if any part of it is obscured by said hill it gains Cover. 38.1.) 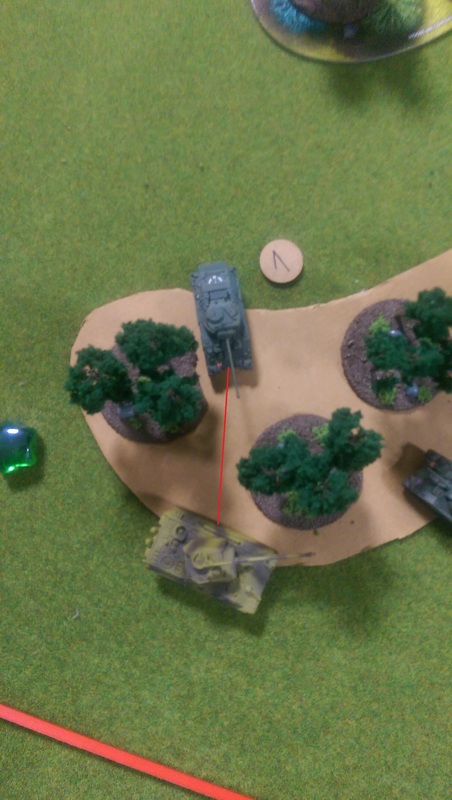 Does my tank with activated Radio Coordinator have to transfer his initiative every turn or is it an optional effect? Answer: The effect of the Radio Coordinator is not optional (weirdly enough). Therefor a tank with a Radio Coordinator MUST transfer its Initiative to another friendly tank in the Shooting Phase. Comment/Opinion/House Rule: It remains unclear when exactly the Radio Coordinator transfers his Initiative and thus could start a chain reaction of initiative zero (0) drops. 38.2.) When does the Radio Operator transfer his Initiative during the Shooting Phase? At the very start - say: before any shooting happens? At its own original Initiative step? At it's new Initiative step (if applicable) (eg zero (0))? The rules only state "During the Shooting Phase". 38.3.) What happens if you equip multiple tanks with Radio Coordinators and one gets Shell Shocked (or similar)? Does this mean 2-3 tanks get affected by a single Shell Shocked-effect automatically? // Alternatively, what happens with multiple "RC's" on different initiative tanks? do they now chain-link the highest initiative value down the line? Comment/Opinion/House Rule: This depends on when exactly the Radio Coordinator transfers his Initiative. 39.) Can I ram another tank? Answer: No, there are currently no rules for ramming other tanks. 40.) Does the "Sharpshooter Gunner"'s effect apply only on the very first uncanceled Critical Hit, or does it apply to the first uncanceled Critical Hit of every turn? Answer: It applies to the first uncanceled Critical Hit of every turn. 41.) Does drawing Critical cards (eg resolving uncanceled Critical Hits) automatically count as taking Damage? Eg when determining if a hit tank loses his “Camo Netting”-Upgrade. Answer: No, not by default. The developers differentiate carefully between “Hit”, “Damage” and “(Special) Effect”. Note: Uncanceled Critical Hits don’t apply Critical Damage - they make you draw Critical cards (not damage!) / Critical cards don’t necessarily inflict damage - rather apply a potential Effect and/or Damage as two different things. Cards that don’t have an Effect don’t apply one, cards that don’t have Damage (red number), don’t inflict any. 42.) Can a "kommissar" execute (discard) himself to activate his effect? Or shoot the fire extinguisher, Ammo or the bottle of Vodka? Answer: Yes, he can. Weirdly enough. The rules do not limit whom or what he may discard (only that it needs to be either a Crew or other Upgrade card), therefor himself being a Crew-Upgrade, he could discard himself. Official: Kommisar card rule text; "Discard one Crew or Upgrade card to cancel a Bailed Out, Shell Shocked, or Stunned Crew effect." Thanks for cross posting and saving this, I have a feeling they'll eventually delete the old forum like they want to do to the fow too. It's happened. The link on the website now leads to the Facebook page. Saw that this weekend On the plus side, they haven't deleted it totally yet, using direct links I can still get to the forum, to see that spam is still posting. Good news is if there's anything left saving it's still there until they get around to permanently deleting.